Out of Print, multiple versions available. Gold HD Edition (Includes Gold Edition). The original release of the game. The game was released several times by different publishers. Current patch is Update 4. The official expansion pack added additional quests and new buildings to the game. Two bonus quests are available to download from the website. Current patch is Update 2. This contains Majesty as well as The Northern Expansion, as separate programs. It is not compatible with the bonus quests. Gold Edition contains the previous patches. Majesty and The Northern Expansion bundled together, now a single program. The bonus quests are included. The game has been rewritten to run on Windows Vista and Windows 7, and no longer runs excessively fast on modern processors. Resolution can now be changed, and the game supports widescreen monitors. Owners of the Steam version of Majesty Gold Edition are given a free upgrade to Gold HD, and buying Gold HD from Steam also installs the original Gold Edition. Patches are available for Windows and Mac OS. The Gold Edition is already patched. Will replace OSS with ALSA in terms of sound output and add additional features. Requires 32 bit version of recent SDL 1.2 library. Run the software with LD_LIBRARY_PATH=/usr/lib32 on at the beginning. If using a 32-bit system use /usr/lib path instead. With use of the -w command line argument. 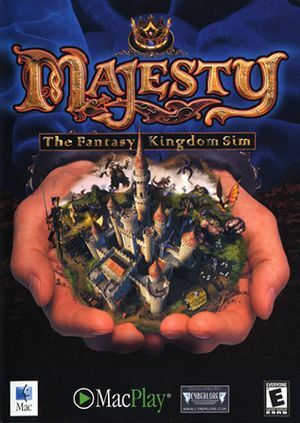 On older versions of Majesty, faster computers could cause the game to scroll excessively fast. Open ScrollSpeed and change it appropriately. Open up the configuration file and add <ScrollSpeed>#</ScrollSpeed>. Replace # with a number. The original versions of Majesty will run on Windows Vista and Windows 7, however the game will be unstable and might crash frequently. A new version of the game is available that fixes a number of compatibility errors with current Windows versions and officially supports them. The command line is for Northern Expansion pack. For base game simply replace the executable name with majesty.exe. No extensive tests were done with this command line, however a several mission playthrough has indicated that game becomes more stable when these parameters are used. On some systems (particularly those with Intel graphics) Majesty Gold HD may not work properly. On loading the game there may be a blank screen, or after the opening movie, the menu appears unresponsive (although it is actually working, but the screen is updating). To fix this, you need to append -useddblit -blitmovietobackground to the launcher's command line arguments. SDL library that is included with the game is set to use OSS for sound only. Run the game in windowed mode using -w command prompt. However, due to the fact that the windowed mode is at fixed 800x600 resolution, you may need to use the resolution scaling using xrandr command, if on 1080p or 4K resolution. The multilibrary version of GCC and 32-bit version of SDL is required for 64 bit system. ↑ 1.0 1.1 File/folder structure within this directory reflects the path(s) listed for Windows and/or Steam game data (use Wine regedit to access Windows registry paths). Games with Steam Cloud support may store data in ~/.steam/steam/userdata/<user-id>/25990/ in addition to or instead of this directory. The app ID (25990) may differ in some cases. Treat backslashes as forward slashes. See the glossary page for details. This page was last edited on 20 April 2019, at 12:48.